CHIAYI, Taiwan--Tens of thousands turned out here for the premiere event of a new film that recounts the inspirational runner-up finish of this southern city's former Kagi Norin school at the 1931 summer Koshien baseball tournament, when Taiwan was a colony of Japan. 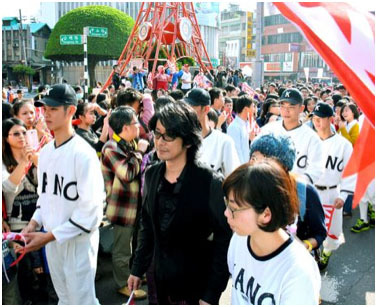 About 60,000 spectators gathered Feb. 22 for a parade by the cast of "KANO" in full costume and popular Japanese actor Masatoshi Nagase. Set during Japan's colonial rule of Taiwan (1895-1945), the film is based on the true story of the team of the Kagi Norin, which became the current National Chiayi University, and its coach, Hyotaro Kondo, a native of Ehime Prefecture. Kondo, played by Nagase, helped lead the team of Japanese, Han Chinese and indigenous Taiwanese players to a victorious campaign at the prestigious Koshien tourney by raising their skill levels and boosting their morale. The movie was produced by Taiwanese filmmaker Wei Te-sheng, who directed "Warriors of the Rainbow: Seediq Bale," a 2011 film that depicts the indigenous Taiwanese people's uprising against Japanese colonial rule. "I think there were both good things and bad things about the period of Japanese rule. I wanted to fairly review the history," Wei said. The film will be released Feb. 27 in Taiwan and is slated for prescreenings in Osaka on March 7 and 11.